The Weimar Republic describes the political system of Germany from late 1918 (the end of World War I) to 1933 (the rise of Nazism). The Weimar Republic began as a bold political experiment. It was initiated by ambitious reformers who hoped to create a modern liberal democracy in a nation that had known only militarism and authoritarian monarchy. Together they drafted and adopted one of the world’s most democratic and progressive constitutions. The first years of the Weimar Republic were unsettled and tumultuous, largely due to Germany’s international isolation and economic exhaustion. In the mid-1920s, Germany moved into a more prosperous period dubbed the ‘Golden Age of Weimar’, marked by economic recovery, social renewal and cultural innovation. 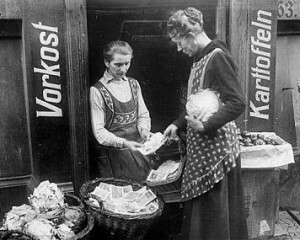 Much of this prosperity, however, was propped up by foreign loans, while the Weimar government remained weak and unstable. The Great Depression of the early 1930s brought the Weimar dream crashing to earth. By late 1933, Weimar democracy had given way to Nazi totalitarianism. The Weimar Republic is of great significance to historians and history students alike. It demonstrates how democracy can fail when it is too ambitious and when internal forces work against it. Weimar Germany was a society at the crossroads of history. It was torn between several old ideas and values of the 19th century (tradition, militarism and authoritarian government) and those of the modern era (republicanism, liberalism and democracy). Understanding how and why the Weimar Republic failed is essential for understanding the rise of Adolf Hitler. In 1920 the Nazis were one of many small groups, filled with disgruntled nationalists and ex-soldiers; their growth, development and rise to power were shaped by the political and economic conditions in the Weimar Republic. The modernist culture of the Weimar era, which flourished in spite of Germany’s political and economic instability, is also worthy of study. Alpha History’s Weimar Republic website contains hundreds of primary and secondary resources for researching, learning and understanding the German republic between 1918 and 1933. Our topic pages contain concise summaries of key Weimar Republic topics and events. These are supported by primary sources, such as a range of documents. There is also useful reference material like a timeline, glossary and profiles of Weimar Republic politicians, military leaders and artists. Finally, Alpha History also provides a range of interactive activities, such as crosswords and quizzes, where you can test your understanding of the Weimar period.